1. Join a summer reading program: Read at least one book every week, and you could win a prize! The Hawaii Public Libraries Summer Reading Programs, June 4 to July 7, are for all ages. Barnes and Noble’s “Summer Reading Imagination’s Destination” (www.bn.com/summerreading) lets kids earn a free book (from a selected book list) by reading eight books and sharing their recommendations. The program runs from May 22 through September 4, 2012. The Old Spaghetti Factory in Honolulu offers a year-round Rewards of Reading program – kids 10 and under can read just five books and get a free kid’s meal (with purchase of an adult entrée). 3. Plan a scavenger hunt: Whether you’re in your backyard, at the beach, or camping – or even at the mall, you can challenge others to a scavenger hunt. All you need is paper, a pen, a list of things to find, a watch to keep track of time, and a bag for your finds (or a camera to snap pictures). The National Wildlife Federation has good tips to teach kids about nature, including a printable scavenger hunt list. 4. Go on a hike: June is Great Outdoors Month and June 9 is National Get Outdoors Day, and many National Parks are offering free admission, including Haleakalā National Park and Hawai’i Volcanoes National Park. For weekend hikes on Oahu, join the Hawaiian Trail and Mountain Club or the Sierra Club Hawaii Chapter; donations are requested. If you have a friendly dog, show up for a Hawaiian Humane Society’s Paws on the Path hike on the last Saturday of every month on Oahu. Beginning hikers can learn about preparing for hikes at http://aditl.com/hike/basic-hiking.html. 5. Host an ice cream social: July is National Ice Cream Month and July 15 is National Ice Cream Day. Set up an ice cream bar with candy and fruit toppings, cookies and cake, syrups and sauces and whipped cream. Then invite all your friends and neighbors! How Sweet Treats has inspiring photos and free printables to customize your ice cream social. You can even make your own homemade ice cream in a bag with this easy recipe from FamilyFun Magazine. 6. Organize a block party: August 7 is National Night Out, a unique crime/drug prevention event sponsored by the National Association of Town Watch (NATW). You can help promote neighborhood spirit with block parties, cookouts, parades, flashlight walks, contests, and youth programs. There is even a free organizational kit that can help you get started. Last year, there were four registered events in Hawaii: Honolulu, Kailua, Maui, and Wahiawa. How will you celebrate summer? What are your favorite summer activities? My husband is a fisherman, and before he leaves, I always ask him who he is fishing with, where he is headed, and when to expect him back. Since he has an iPhone, I can check up on him, looking for that small green dot on the iCloud map. But I still worry, especially when he fishes alone. May 19-25 is National Safe Boating Week and I’d like to remind everyone to be careful in the water and treat the ocean with respect. Boaters, fishermen, and paddlers need to plan for emergencies. In Hawaii, scouring the ocean for missing boaters, fishermen, and paddlers is time-consuming, exhausting, and expensive. Rescue crews may have to search thousands of square miles of ocean. Every hour in a rescue mission costs around $17,000 for a C-130 aircraft, $7,000 for a Dolphin helicopter, and $4,000 for a Cutter or station small boat, according to the KHON2 News website ( “US Coast Guard push use of stickers that save lives and taxpayer dollars” (1/20/12). Not to mention the worry and fears of the ones left behind on shore. 1. Plan ahead. Check Hawaii beach, weather, and surf reports. 2. Wear a life jacket. Choose the right life jacket, make sure it has the proper fit, and wear it. 3. Write a float plan. Leave a float plan with someone you trust. 4. Use a Paddle Smart sticker. A simple Coast Guard “Paddle Smart” weather-proof sticker with your phone number, placed on your kayak, canoe, or surfboard ensures that you get property back, and can eliminate unnecessary search-and-rescue missions. The Hawaii Division of Boating and Ocean Recreation recommends taking boat safety classes through the 14th District US Coast Guard Auxiliary, which offers several boating safety, boating skills, and navigation classes on Oahu; or the Honolulu Sail and Power Squadron (the Aloha Squadron), which offers basic boating and Seamanship classes, including a “Skipper Saver” program to learn about operating a boat safely in an emergency. Whether you have a boat, paddle, surf, or enjoy watersports, it’s a good idea to know how to swim. Every summer, the Hawaii Red Cross offers free swimming lessons for children and adults at Ala Moana Beach Park in Honolulu. We’re lucky to be surrounded by the beautiful waters of Hawaii, but remember to treat the ocean with respect and humility! April was Financial Literacy Month, but most of us were probably overwhelmed by our tax returns to change how we manage our money. We’ve had four weeks to recover from the stress of Tax Day, and I think that it’s a good time to make a clean start with our money and finances. 1. Spend less than you earn. “Lowering spending to increase investment income is the way to grow wealth” (page 48), Hunt advises. 2. Save for the future. “As you receive income, transfer 10% of it into long-term savings” (page 64). Your emergency fund should be six months of paychecks, kept in a separate account that is safe, available, and interest-bearing. 3. Give some away. “Giving is the way that you express just how grateful you are for all that you have” (page 85). Hunt suggests a 10-10-80 rule: save 10%, give 10%, and live on 80% of your net income. 4. Anticipate irregular expenses. Plan for irregular and unexpected expenses like auto maintenance, pet care, Christmas, property taxes, vacations, and gifts. 5. Tell your money where to go. “A good Spending Plan addresses every bit of income by giving every dollar a specific job to do” (page 100). List your income, essential fixed expenses, non-essential expenses, and miscellaneous monthly expenses. 6. Manage your credit. “A high [credit] score is one of your most valuable money management tools” (page 112). To be creditworthy, you don’t need to be in debt; you just need to use credit at least three times a year, and pay the balance in full. 7. Borrow only what you know you can repay. “The only safe way to borrow money is to have a means to pay off the debt in reserve” (page 128). Borrow the least you can get by with to achieve your intended result, repay debt quickly, and have an escape plan. To learn about the Rapid Debt-Repayment Plan and read money management articles, visit DebtProofLiving.com. Or take Financial Literacy Month’s “Thirty Steps to Financial Wellness” pledge at http://www.financialliteracymonth.com/Default.aspx. How do you keep yourself debt-free and in the green? What money management tips can you share? 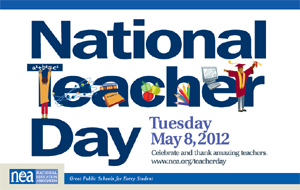 Today is National Teacher Day, when we can honor and show our appreciation for teachers. 1. Send a teacher a thank you card. Ask your child to draw or write a personal thank-you and give it to your teacher. Or surprise them with an ecard at the Teacher Thank-You Project (www.teacherthankyoucard.org) or from websites like Blue Mountain (www.bluemountain.com), Hallmark (www.hallmark.com), and Yahoo (www.yahoo.americangreetings.com). 2. Give a teacher appreciation gift. The Tip Junkie blog offers a lot of inexpensive homemade gift ideas that look fabulous, from the fun (a crayon picture frame or a pencil vase) to the elegant (a fabric composition book cover) to the practical (a goodie box or survival kit). 3. Nominate a classroom superhero. Parents, students, and community members can nominate a superhero educator through the Classroom Superheroes project (www.classroomsuperheroes.com). Your favorite teacher could be featured on the website, and other people can leave comments and post videos. 4. Create an online tribute. Make a video tribute to your favorite teacher and upload it to the “My Amazing Teacher” project on Parenting.com. How has a teacher made a difference in your life? How will you show your appreciation for your favorite teacher? “Hula is a world we must respectfully enter – where dance, spirit, and nature’s love are united, and where dance is so deeply connected to the daily life,” wrote Elizabeth Zana. “Hula is the language of the heart. The heartbeat of the people of Hawai‘i,” wrote King David Kalakaua. 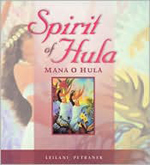 “Spirit of Hula: Mana o Hula” (2004) by Leilani Petranek is a small, inspirational book that expresses the spirituality, beauty, and interconnectedness of hula through eloquent words and enchanting art. It celebrates the sacredness of dance and the power of women and creation. May 1 is Lei Day in Hawaii, a symbol of aloha and hospitality. It can also be a reminder to slow down and smell the plumeria. 1. 5-minute thankfulness: Give yourself at least 5 minutes to step outside, breathe in the fresh air and fragrant flowers of Hawaii, and think about the good things in your life. Be thankful for everything you have, and share your appreciation with others. 2. 5-minute meditation: You don’t need long sessions or uncomfortable poses – just 5 minutes of meditation can help you relax and unwind. Get comfortable, close your eyes, and relax. Take deep breaths from your diaphragm and release the tension in your body. Instead of “thinking of nothing,” focus on being, advises wellness coach and About.com’s Stress Management Guide Elizabeth Scott. 3. 5-minute reading: Don’t have a lot of time to read? Check out “The Intellectual Devotional.” a series of books with a year’s worth of daily readings on tops such as health, modern culture, American history, general knowledge (history, literature, visual arts, science, music, philosophy, and religion), and biographies. You can even sign up to receive daily emails on DailyLit.com. 4. 5-minute cleaning fixes: If you only have a few minutes to clean, here are some shortcuts you can take to clean your home: take care of basics like the floors and kitchen dishes; dust tabletops and picture frames; wipe down the bathrooms; straighten furniture; and hide your clutter, shares blogger Sarah W. Caron in her post, “5 fast cleaning fixes in 5 minutes or less”. 5. 5-minute workout: If you have 5 minutes, you can have a great workout! Published in Fitness Magazine, Keli Roberts of the TimeSavers workout videos has a 5-minute workout that exercises every major muscle group in your body. Repeat each of the 5 exercises for just 1 minute: 1. clean and press; 2. side lunge and row; 3. plié squat and biceps curl; 4. push-up plus; and 5. single-leg deadlift with kick-back. What can you do with 5 minutes? What are your favorite ways to take 5 minutes for yourself? You are currently browsing the Better Hawaii weblog archives for May 2012.